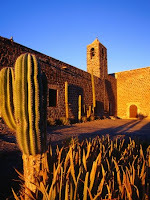 Mission Santa Rosalía de Mulegé was founded in 1705 by the Jesuit missionary Juan Manuel de Basaldúa at a ranchería of the local Cochimí, which was known as Mulegé, in Baja California Sur, Mexico. The site lies near the entrance of Bahía de Concepción, on the Gulf of California coast. A few odd details of the mission's history are known. A hurricane in 1717 devastated the agricultural fields that supported the settlement. Construction of a stone church was begun in 1766. In 1768, when the Franciscans tookover responsibility for Baja California from the Jesuits, there were reportedly still some 300 Indian neophytes at Mulegé. However, by 1770, the mission was virtually deserted. The Dominicans, who succeeded the Franciscans in 1773, began rebuilding, but the population remained less than 100. The mission ceased to function in 1828. The present church buildings have been extensively restored.